There’s a dog on the roof! As we approached the crest of the first dune, our driver turned to our group of 7 and said (in Spanish), “Sandboarding is dangerous. Be careful.” And with that, we were OFF! 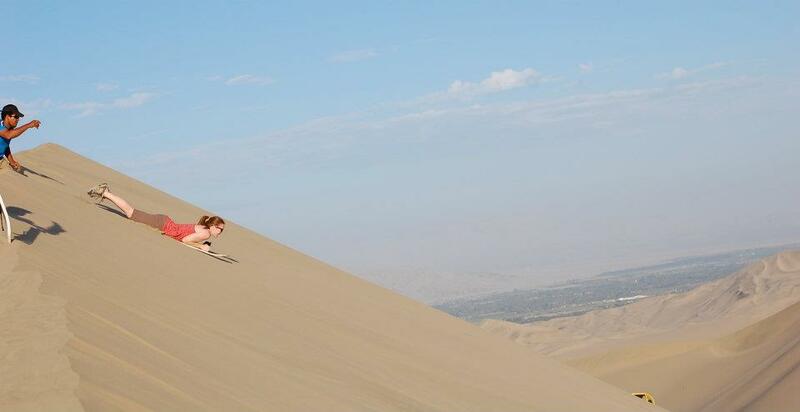 Straight down the dunes on either our stomach (me) or like a snowboard (Adam) at speeds of what felt like 30 mph. No waivers were signed beforehand, no safety checks in place, no 1-hour practice session– just straight adrenaline, just the way I like it! Between each trip down a dune, we barrelled around the desert near Huacachina, Peru in what looked like a 4×4 on some serious steroids. A roll bar and overhead harnesses kept us “safe” as we experienced a real life roller coaster ride. After coasting down 8+ dunes with varying success (Adam was the only person to make it over a double-dune combo, slamming his chest into the board as he hit a slight bump at the bottom), we arrived at the top of one of the biggest dunes to watch the sunset. There have been times in my life where I take a step back and think, “Wow, I can’t believe this is real,” and this was absolutely one of those moments. There's a dog on the roof! Ali – Looks like so much fun! I can’t wait to read more of your posts! So, like snow, but grittier and hotter. No soft landings?